Aged eight years old, I used to spend hours rummaging through my mothers jewellery collection, trying everything on and occasionally popping on a ring to wear for the day. But sure enough before I would plunge my hand deep into the bucket of soaked sludgy black sugar beet, which was being prepared for the horses, the Emerald and Diamond ring was whipped away by her!! Apparently wearing fine jewellery in stables isn't cool?! 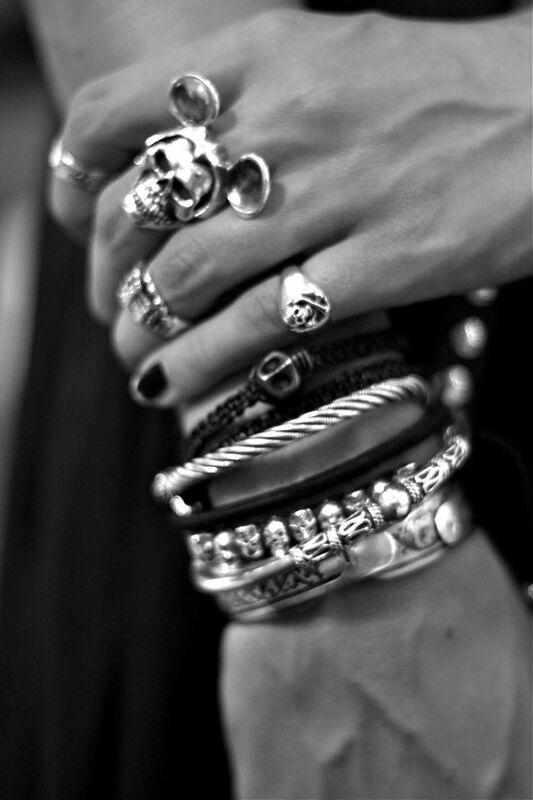 Today I still have an obsession with jewellery, although more rock chick crazy jewellery rather than the diamonds! Some of my favourite designers include Stephen Webster, Dominic Jones, Shaun Leane and Dinny Hall. Another designer to watch out for on the jewellery front is Bex Rox, this is one of her Antelope rings - soo cool! I have to admit my obsession with skulls doesn't seem to be one of my fashion fads, I love this chicks style and jewellery, I style snapped her a few weeks ago actually! I love this girls rings, I snapped her at the London Fashion Week Alice Temperley show. Like your clothes/styling, the jewellery you wear can really speak volumes about you. I'm on the hunt now for some big silver rings with stacks of attitude or anything with skulls! So whose your favourite jewellery designer at the moment? The first ring is amazing! 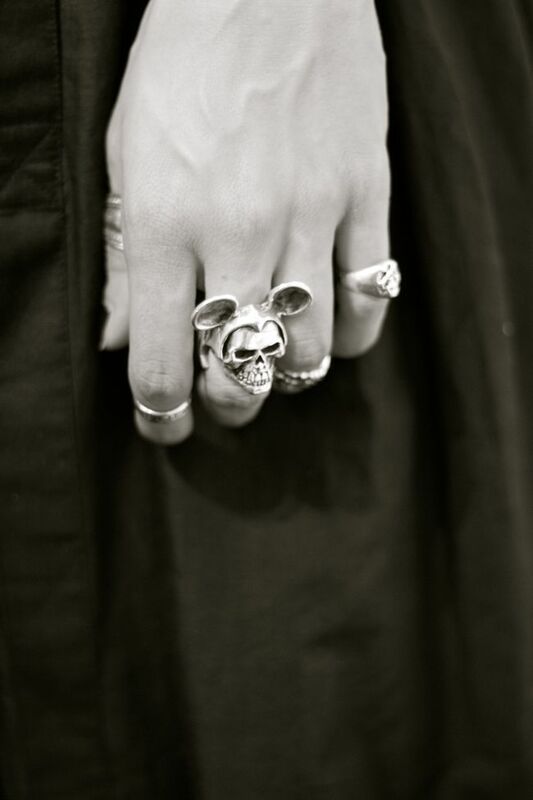 You would totally rock with the mouse-eared skull ring! 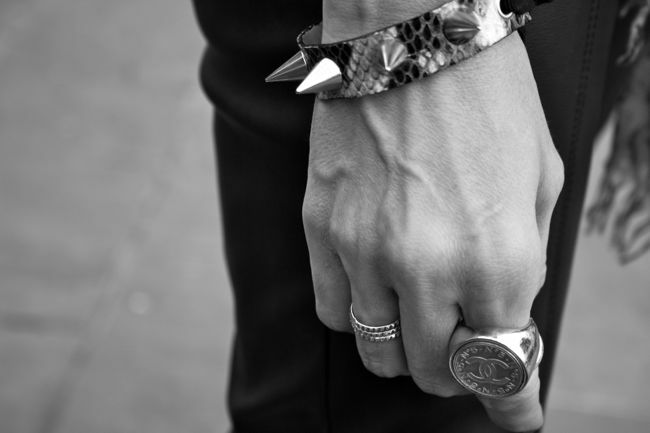 Stunning pictures, all this jewellery is cool. I love your blog by the way! I have a massive obsession with skulls right now...I cannot get enough of them!